— All imported garlic is sprayed with methyl bromide when it comes into Australia, not only does methyl bromide deplete ozone, but it is also harmful to humans. As well as this, much of our imported garlic comes from China where pesticides are routinely used, and only 5% of vegetables imported from China are checked for chemical residue. 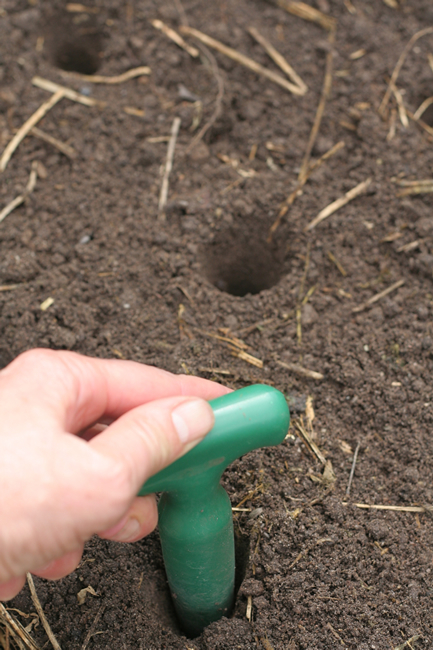 Choose a spot that gets plenty of sun and prepare the soil by adding well-rotted manure and some blood and bone and compost. 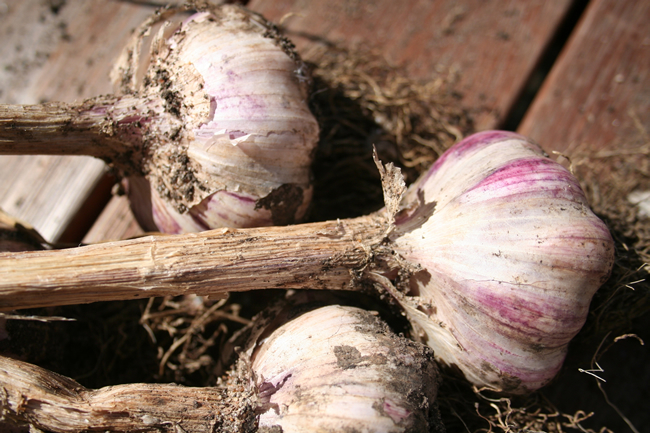 Garlic hates growing in soggy soil, so make sure the soil is well-drained. If the drainage is not good then create a raised mound and plant the cloves into this. Most garlic that you find in supermarkets has also been sprayed with sprout inhibitors so that they don’t sprout during storage. 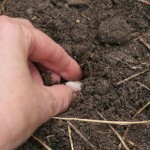 This means that they sprout at the wrong time of the year (usually spring) when it is too late to plant them. So buy organic garlic from you local green grocer or buy it from a reputable seed supplier. 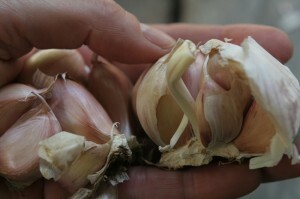 This year both Diggers and Green Harvest are selling a good range of organic garlic. 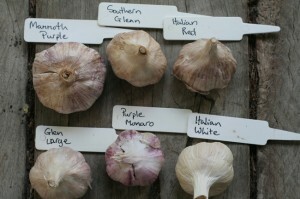 Garlic does best in the southern states. Like onions, garlic bulbs begin to swell as day length increases, this means that many garlic varieties are not suitable for warmer regions like Northern NSW and Queensland. One day length neutral variety that does well in these regions is Glenn large or Southern Glenn. Most varieties fall into two groups, hard neck or soft neck. The hard neck varieties have a central stem that produces a flower head. This flower head contains bulbils, not flowers. Hard neck types have larger, but fewer, cloves per head, are easier to peel but don’t keep for as long (about 4 months) as soft neck types. Soft neck types do not produce a flower stem and have smaller but more numerous cloves. Bulbs keep for about seven months. 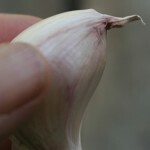 I use a 'dibber' to make the hole for the garlic clove. Plant the clove pointy end up. 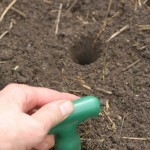 Make holes in the soil about 15cm apart. 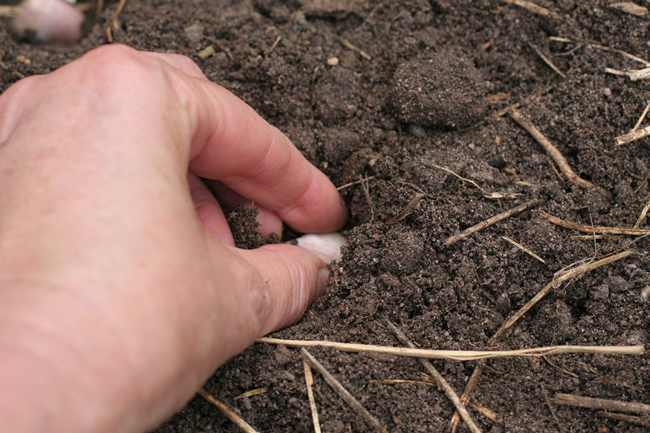 I like to use the dibber that I use to plant bulbs, but your finger or a small trowel will do. Break the bulb into the individual cloves, do not remove the skin from the clove, and plant with the pointy end up so that the top of the clove is the length of the clove under the soil. Cover with dirt and water well, but don’t water again until the cloves have started growing otherwise they may rot in the soil. When the green leaves are well above the soil, mulch with pea straw, lucerne hay or sugar cane mulch. Now sit back and let them grow, just checking occasionally to make sure they are growing strongly. I will write again in a few months to tell you about what happens next. If you want to know more about garlic, how to cook with it and it’s fascinating history as well as other Allium plants like onions, shallots and leeks you could purchase my book Garlic and friends from the shop. Remove the giblets, neck and any excess fat from the chicken. Rub the salt and pepper on the inside and outside. Place the bunch of herbs and four cloves of garlic inside the chicken. Into a casserole dish just big enough to hold the chicken, pour the oil and spread the rest of the garlic cloves evenly ove the bottom. Gently heat the oil and then put the chicken into the dish, turning it so that it is coated with oil. Put the lid on the casserole dish and seal it to the base with the flour and water mixture. Place in a pre-heated, moderate oven and cook for one and a half hours. Remove from the oven and open the dish by breaking the crust. Carve the chicken and serve with the juices, the baked cloves of garlic and some crusty bread. 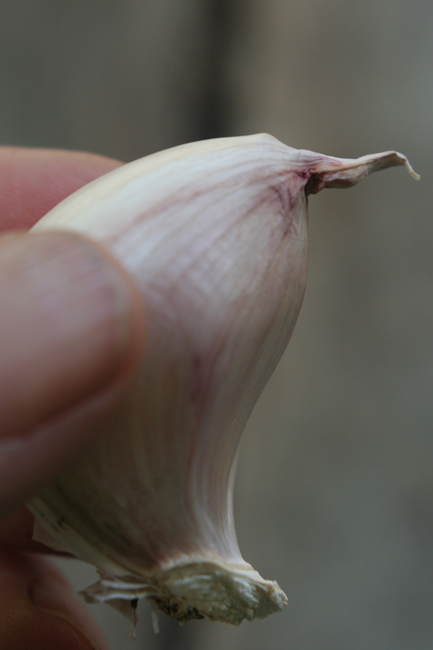 The soft, sweet flesh of the garlic cloves is simply eaten by squeezing it out of the skin. It has a delicious nutty flavour. Thanks for the planting instructions and the recipe. Having just bought 2 heads of locally grown (Gippsland) garlic which is pesticide free I will devote one head to the chicken and commit one to the ground. A question: I have found a couple of garlic plants around the garden which do not have separate cloves. These one clove heads are delicious – quite mild. Is this a specific variety of garlic or simply previously cloved headed garlic which has lost it over many years of neglect? (I took over an overgrown garden in 2009 and am still findings lost treasures and oddities. I planted lots of garlic from Diggers early in the year and today dug one up and it only had the one round with a few tiny ones at the base. Wonder what went wrong?